2-7 Were the “Comfort Women” actually treated well? There are some people who insist that “comfort women” of the Japanese army were treated well. Their arguments are based on Report No.49, issued by the Office of War Information (OWI), October 1st, 1944. Let us take a look at this report and see whether “comfort women” were really treated well. Among the victims of human trafficking and forced prostitution in the present era, there is a very small number who manage to achieve a measure of success. For instance, some earn a huge amount of money and send it back home. Some become brothel owners. Even during the enslavement of blacks, some among the victims succeeded economically. Historically, under systems of discrimination or systems that violate human rights, there are some people who succeed economically. But even if this is true, nobody can say that slavery was good. Those who try to justify a certain system always mention the rare successes, but we must not be deceived. We need to look at how society really works. 2. Important points when reading the OWI reports: how were these reports made? 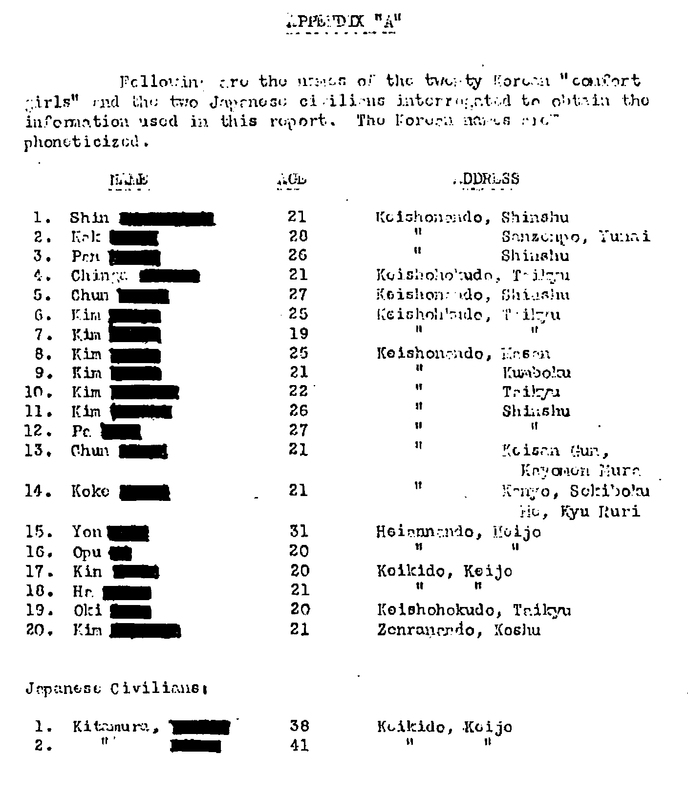 In the report shown above, twenty Korean “comfort women” and two Japanese owners are questioned. Since the American staff doing the questioning in Japanese would probably not have understood Korean, we must expect that when the owners tried to justify their actions, the staff would have written a report biased in their favor. (1) Women were lied to when they were recruited. 2) Most of them had never been connected with prostitution before then. Of course, fraud can not be justified even if any of them had had some involvement in prostitution. (3) Women were tied down by advance payments. This makes it clear that human trafficking took place. (4) More than half were minors. They were questioned in August and September 1944, and taken to Burma in August 1942. This makes for a two year interval, hence among these twenty “comfort women,” twelve were under the age of twenty-one when they were abducted. Those under the age of twenty-one are regarded as minors by international law. Trafficking in women and children and its role in prostitution and labor exploitation is illegal by the International Convention for the Suppression of the Traffic in Women and Children of 1910 and 1921, which applies even in cases in which a victim might have agreed. Japan had also signed this treaty. Based on this report, regardless of what other excuses are made, this is obviously a crime that violated international law. When Japan signed to such an international treaty, it would attach a condition that exempted it from applying the treaty in its colonies. However, with women taken away on ships sailed under the Japanese flag, the treaty applies (the women brought to Burma were on such ships). And excluding colonies from the area of application can not always be said to be legal. Even based on the interpretation that actions ordinarily regarded as crimes would have been blithely legal when carried out against women in the colonies is at best discrimination, and making that justification in itself is equal to confessing to being racist. (4) According to the report and SEATIC Report No.2, there were contracts made that women could go back to their country when they had repaid their debt. In fact, nobody could go home, under the pretext of the situation of the war. We clearly see that women who had never worked in prostitution were taken overseas through lies (fraud) and advance payments (human trafficking). These things violate article 226 of Japan’s criminal code at that time. Moreover, as more than half of the women were minors, even if they went of their own accord, it was still a violation of the international treaty.